The Oral-B 7000 is an expensive but fairly priced smart toothbrush. Its handy wall-mounted SmartGuide and compatible app will help you reach your dental goals. The Bluetooth-enabled Oral-B 7000 is more than your average electric toothbrush. Aside from its pressures sensors and a variety of cleaning modes, it also features brushing guides and activity trackers that can help you maintain routine and improve cleaning. There’s also a fairly useful set of instructions for things like fighting plaque and a wall-mountable digital assistant called the SmartGuide, along with a companion app to improve your brushing technique. The Oral-B 7000 can your at-home dentist and comes with the price tag to prove it. We spent over a week with the Oral-B 7000, evaluating the toothbrush’s design, usability, and cost to determine if it was worth your hard earned dollars. The Oral-B 7000 emphasizes functionality over aesthetics. The brush’s handle is thick with a rubberized no-slip grip. Oral-B offers seven compatible brush heads. The included options are for advanced overall clean, whitening, and sensitivity. You also get a brush head storage case that covers the bristles, but doesn’t touch them in order to ensure hygiene. The easy-open travel case has compartments for extra brush heads but no charging functionality. If you’re planning to travel you’ll need to pack the charging base separately in its provided travel sleeve. The SmartGuide that comes with the toothbrush is a silver puck with a digital face that shows you your brushing time and a visual indicator of how good your brushing is. It’s wall-mountable, and once you have it set up it automatically connects to your toothbrush. Setup for the brush and app is simple, but the SmartGuide assembly isn’t as intuitive. For the brush: attach the replacement brush holder to the charging base. Place the handle onto the base. 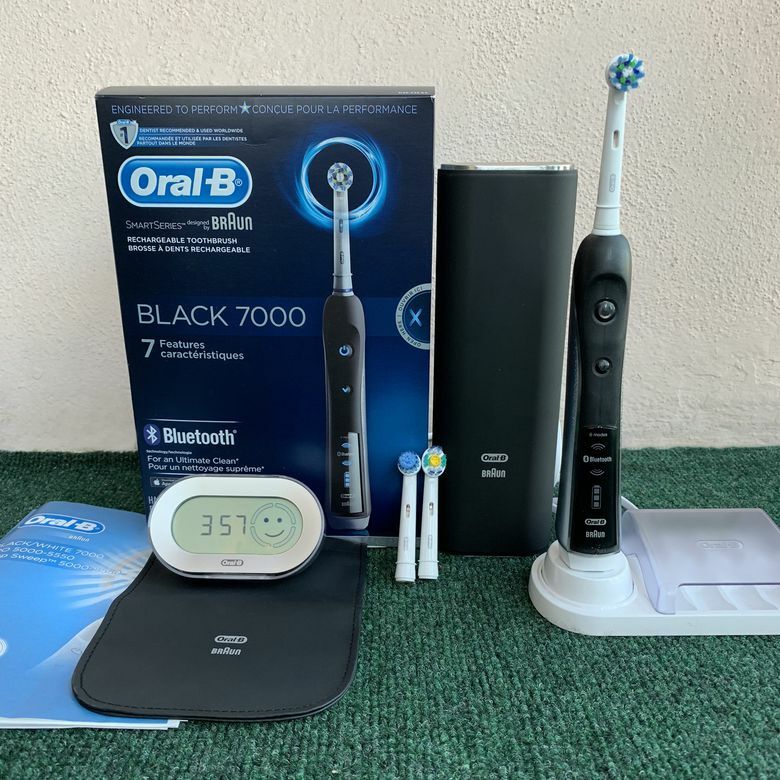 For the app: download the Oral-B app from the Google Play or Apple App store, turn on your phone’s Bluetooth (the toothbrush supports 4.0), and then follow the on-screen prompts to connect. Its handy wall-mounted SmartGuide and compatible app will help you reach your dental goals. With the SmartGuide, you’ll need to take it off the default demonstration mode by opening up the back and pushing one of the small unlabeled buttons. You can then set the clock to the current time, which is what it displays when it’s not in use. To mount the SmartGuide to your wall, slip it into the clear plastic case that’s provided and attach the adhesive to your bathroom wall. We recommend following the instructional diagram that’s included. The Oral-B 7000 provides a thorough clean with six available modes: Daily Clean, Deep Clean, Whitening, Massage, Sensitive, and Tongue Cleaning. Daily Clean offers an overall mouth clean, and Deep Clean provides a similar experience with firmer pressure and a longer brush time. The Whitening mode is geared specifically toward polishing the teeth, while Massage offers a pulsating sensation for the gums. Sensitive provides a softer brush experience and Tongue Clean gives a steady pressure for direct tongue contact. You won’t find hugely variable user experiences across the different modes. All the standard settings offer an effective clean, and the gum massage and tongue cleaner are effective additional modes. We expected the Whitening mode to feel the firmest, but found it was actually comparable in pressure to (or even a little less soft than) the Daily Clean. Our preferred mode was the Deep Clean, which offered a strong pressure sensation, similar to what you feel in a dentist’s cleaning session. We also did perceive a slightly softer feel on the Sensitive setting for those looking for a less intense experience. The settings are also impacted by your choice of brush head. Switching to the Whitening brush head offered a firmer experience across modes, while the Sensitive brush offered a gentler one. We experienced the least firm sensation with the Sensitive brush paired with the Sensitive setting. If your goal is to improve oral hygiene, the Oral-B 7000 will get the job done. While the brush handle has a wider, clunkier shape than many other brands, it still weighs just under three pounds and is easy to hold while you brush. The brush has an automatic two-minute timer that vibrates at 30-second intervals for quadrant switching, and a sensor that turns red if it gauges too much pressure. If it turns red that’s a sign for you to ease up to avoid damaging your enamel. The toothbrush lasts about ten days (at 4 minutes of usage per day) after a full charge. Most of the time you can just keep it in the charging base and never have to worry about it. For basic functionality, you need to enable the accompanying Smart Guide and mount to your bathroom wall. As mentioned before, it automatically pairs via Bluetooth. It only offers basic functions, but ones that are essential. It displays the timer and keeps you on track to make sure you brush all four quadrants of the teeth. Most notably, it’s the only way — apart from the app — to let you see which brush mode is currently enabled. When you aren’t brushing, it displays the time, doubling as a bathroom clock. The Oral-B app offers a variety of ways to personalize your brushing experience. You can choose from 5 different Dental Health Care Journeys that target different goals: Fresh Breath, Plaque Fighter, Whitening, Gum Health, or Ortho Care. Each offers two different length options. For example, you can take either a 5-day or 2-week Fresh Breath journey. When we selected the 5-day journey, the app then recommended the best brush head to use to address that specific goal. It instructed us on how long and what time of day we should brush, and automatically set the brush handle to employ the proper modes. The app also tracks your brushing activity — it can store up to 6 months of data — and allows you to see logs for the past day, week, month or full history. It uses that collected information to mark your progress toward different achievements like “7 Day Brushing Streak” or “Most Improved.” By default, the app provides news updates at the bottom of the screen to help motivate or entertain you while you brush, but to avoid an unwanted influx of headlines, you can open Settings, select Content, and uncheck News options. The app will also warn you that your toothbrush has low battery with an alert that appears while brushing. Like the SmartGuide, the app displays both the timer and brush mode during the daily brush session. However, without a wall mount, it’s difficult to look at while also paying attention to your mouth. If it had a wall mount — as the Oral-B 8000 offers — the need for the SmartGuide would be eliminated. We found the app to be a useful tool to help guide us toward the best employment of the brush’s different features, but for a hands-free experience the SmartGuide was easier to use on a daily basis. At $129.94 MSRP, the Oral-B 7000 is costly, but within the standard range for smart toothbrushes. Oral-B Bluetooth products typically start at about $130 and go up to the $200-$250 range. The Phillips smart electric toothbrushes all run over $200. You’ll find a cheaper app-compatible option with the Colgate Smart Electric Toothbrush at $100, though it comes with fewer accessories. The Colgate Connect E1 toothbrush offers a slightly cheaper and more stylish smart option with pressure sensing and activity logs. It also offers mouth imaging to reach easily missed brushing spots. Only Oral-B offers the hands-free app experience and a travel case. If you have a flexible budget, you might consider the slightly more expensive Oral-B Genius Pro 8000. It comes with a phone mount, eliminating the need for the SmartGuide, and incorporates brush placement guidance. Though technically heavier than the 7000, it has a lighter feel. Need some more help finding what you're looking for? Read through our list of the best electric toothbrushes. An elevated everyday clean worth its price tag. The Oral-B 7000 is an effective smart toothbrush that won’t break the bank. While not as efficient as the pricier Genius 8000, it offers a satisfying clean with advanced app capabilities and comes with the useful SmartGuide. If your goal is to improve oral hygiene, the Oral-B 7000 will get the job done. Product Dimensions 1 x 1.5 x 9.5 in.